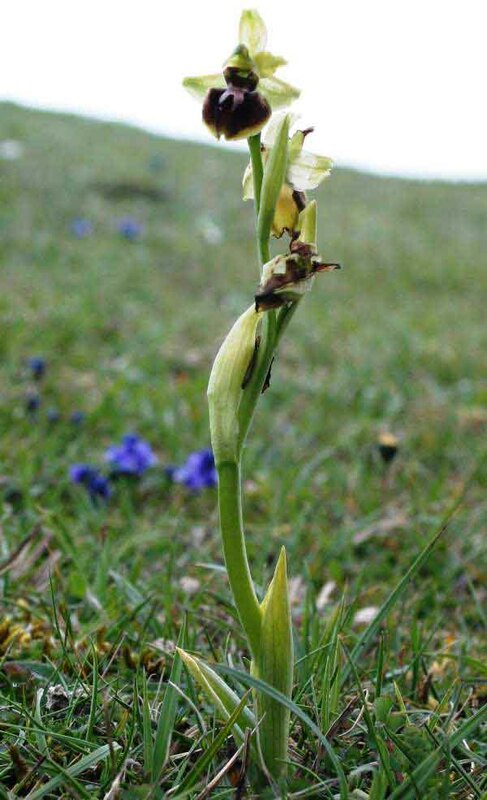 This orchid is the earliest to appear in the UK despite being at the most northerly reach of its territory. Primarily a Mediterranean species, only time and climate change will tell if it continues to survive and extend its presence there. So variable is the appearance (morphology) of this orchid that at least 12 subspecies (pollinated by different insects) are recognised throughout its territory. The plant is slender and grows to around 20cm in the UK but can be much taller in other parts of its range - up to 70cm. Each inflorescence carries between 2 - 18 flowers. The sepals and petals are greenish-yellow sometimes marked with reddish-brown.The lip is dark reddish-brown and velvety in appearance. In some specimens there is a narrow border of green-to-yellow around the margin of the lip. The speculum is H-shaped and is a main distinguishing feature of this orchid, although there are one or two subspecies where the mirror is sometimes absent - Ophrys gortynia, for instance. From southern England across central and southern Europe as far south as the Mediterranean and east to the Aegean. Ophrys sphegodes grows in open areas of impoverished grassland and in semi-shaded woodland edges. It requires calcareous substrates. The specimen at the top of the page was photographed in Dorset in April, and the one at the bottom in the Gargano Peninsula area of southern Italy.